Overseen by the Vice Chancellor for Diversity, Equity, and Inclusion plans, designs, leads and facilitates institutional equity, diversity and inclusion change actions, initiatives and communications in collaboration with campus partners. It leads and facilitates the ongoing implementation and accountability of the university’s strategic vision for diversity and inclusion, consulting and collaborating with partners and stakeholder groups. It serves as the primary and central contact point and liaison with the UC Office of the President, UC Office of Diversity and Engagement and UC Systemwide Chief Diversity Officers. Please read Chancellor May's announcement of Dr. Tull's appointment here. Raquel E. Aldana joined the law faculty and was appointed associate vice chancellor for academic diversity at UC Davis Diversity in July 2017. In 2017, the university adopted “A Diversity and Inclusion Vision for UC Davis” to set the course for the campus to act on its commitment to diversity and inclusion excellence. AVC Aldana joins a dedicated team to engage the UC Davis community in the implementation of this Vision Plan. AVC Aldana also serves as a resource to deans, vice chancellors, vice provosts, other senior administrators faculty on matters of diversity and inclusion for academic personnel. AVC Aldana has led the institutionalization of the ADVANCE National Science Foundation Grant and has proposed several new initiatives to sustain the important gains in diversity and inclusion for faculty at UC Davis. She works with key partners across the campus to increase diversity in the pipeline toward academic careers at UC Davis and to promote an institutional cultural that values multicultural perspectives on teaching, research, and service. As UC Davis moves closer to becoming a Hispanic Serving Institution, AVC Aldana will lead the implementation of a the campus vision on becoming a premier HIS land grant, R1 institution. AVC Aldana joins UC Davis after 17 years as a law professor first at the University of Nevada, Las Vegas, where she was tenured, and most recently the University of the Pacific, McGeorge School of Law. AVC Aldana has innovated to provide students with opportunities for transformative growth as culturally sensitive lawyers and advocates. Her scholarship focuses on transitional justice and criminal justice reforms in Latin America as well as immigrant rights in the United States. AVC Aldana has served in several leadership roles within institutions of higher learning in the community. At McGeorge, she was associate dean for faculty scholarship and led several immigrant rights initiatives. She has worked with the City of Sacramento and with state legislators to advance initiatives or laws to improve immigrant rights in the state. She has served as a member of the American Bar Association’s (ABA) Council for Latin America as part of the Rule of Law Initiative and is currently part of the Council for Racial and Ethnic Diversity in the Educational Pipeline. 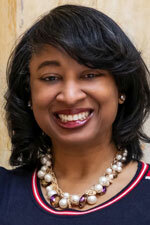 She is also active in the American Association of Law Schools (AALS), most recently serving as AALS Reporter. She has served as co-President and on the Board of the Society of American Law Teachers, one of the largest membership organizations of law professors promoting access and diversity in law schools and the profession. 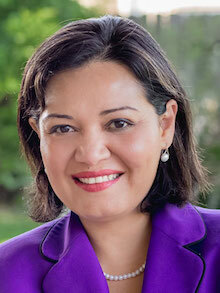 AVC Aldana is a graduate of the Harvard Law School and of Arizona State University (ASU). She is a proud graduate of ASU’s Upward Bound program, having received TRIOS National Achiever’s Award in 2012. AVC Aldana also received the Unity 2012 Community Service Award from the La Raza Lawyers Association of Sacramento; the 2017 University of the Pacific’s Champion of Diversity and Inclusion award; and the 2018 Justicia para Todos Award from the McGeorge Latino Law Student Association.